Thankfully the really heavy cloud held off for most of the event, but we had to view most of the eclipse through a thin layer of cloud that made the viewing experience a little hazy. 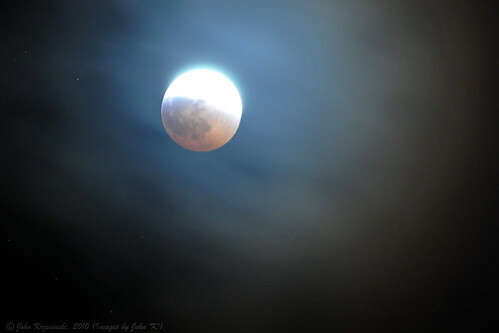 2008-02-20_Lunar_Eclipse 6, originally uploaded by Images by John ‘K’. 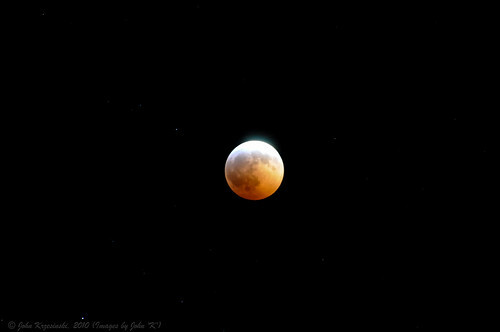 Unlike a total eclipse of the sun, which is only visible to those in the path of totality, eclipses of the moon can usually be observed from one’s own backyard. The passage of the moon through the Earth’s shadow is equally visible from all places within the hemisphere where the moon is above the horizon. The total phase of the upcoming event will be visible across all of North and South America, as well as the northern and western part of Europe, and a small part of northeast Asia, including Korea and much of Japan. Totality will also be visible in its entirety from the North Island of New Zealand and Hawaii — a potential viewing audience of about 1.5 billion people. 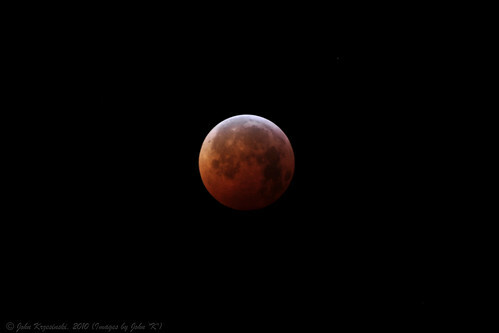 This will be the first opportunity from any place on earth to see the moon undergo a total eclipse in 34 months. There is nothing complicated about viewing this celestial spectacle. Unlike an eclipse of the sun, which necessitates special viewing precautions in order to avoid eye damage, an eclipse of the moon is perfectly safe to watch. All you’ll need to watch are your eyes, but binoculars or a telescope will give a much nicer view. The eclipse will actually begin when the moon enters the faint outer portion, or penumbra, of the Earth’s shadow a little over an hour before it begins moving into the umbra. The penumbra, however, is all but invisible to the eye until the moon becomes deeply immersed in it. Sharp-eyed viewers may get their first glimpse of the penumbra as a faint smudge on the left part of the moon’s disk at or around 6:15 UT (on Dec. 21) which corresponds to 1:15 a.m. Eastern Time or 10:15 p.m. Pacific Time (on Dec. 20). The most noticeable part of this eclipse will come when the moon begins to enter the Earth’s dark inner shadow (called the umbra). A small scallop of darkness will begin to appear on the moon’s left edge at 6:33 UT (on Dec. 21) corresponding to 1:33 a.m. EST or 10:33 p.m. PST (on Dec. 20). 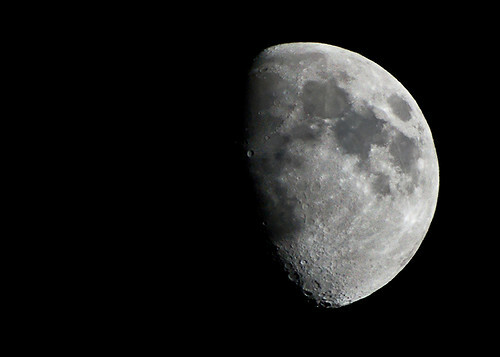 The moon is expected to take 3 hours and 28 minutes to pass completely through the umbra. The total phase of the eclipse will last 72 minutes beginning at 7:41 UT (on Dec. 21), corresponding to 2:41 a.m. EST or 11:41 p.m. PST (on Dec. 20). Originally uploaded to Flickr by Images by John ‘K’. I had been hoping to get a clear moon shot every night this week to track the moon’s transition to being full, but the weather was against me. Tonight the sky was covered with fluffy white clouds through which the moon would make an occasional appearance. The moonlight on the back of the clouds made for a beautiful scene though, so even though this wasn’t the crisp clear moon shot I was hoping to grab, I decided to get an image of the sky anyway. Now anyone who knows anything about digital photography will know that there is no way I got this picture from one shot – to get the right exposure for the clouds the moon ends up as a ball of white light. 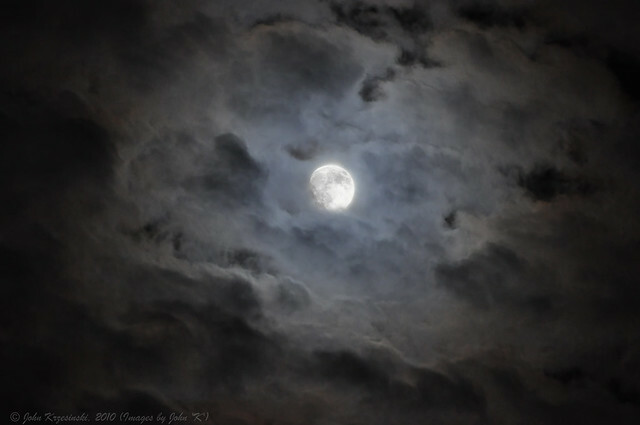 To get the right exposure for the moon, the clouds in the sky disappear into the darkness of the night. So to make this image I had to take two shots and then merge them together. I’m quite pleased with the result though. My friends on Flickr call me “The Moonman” because I seem to be fixated with photographing the moon. Am I The Moonman or simply a lunatic? Moon, 38% off, originally uploaded by Images by John ‘K’. After much early experimentation trying to get something I considered to be a half-way-decent photo of the moon using the equipment I have, I came up with the following guidelines….. (these are based on my experiences with 2 Nikon cameras, a D40x and a D5000, usually with my AF-S NIKKOR 70-300mm 1:4.5-5.6 G lens – feel free to adjust this to fit your equipment!)….. * Pre-focus the shot and then turn AF off for when you take it (sometimes AF will do funky things when you don’t want it to). * If you want clarity, don’t shoot with the moon low on the horizon. * If you really want clarity, you want the moon to be fairly high in the sky at a time when the sky itself still has some light (dusk). Moon shots typically need a bit of post-processing, but be careful to not overdo it. * Contrast and level adjustments give the most bang for the buck. * Keep sharpening to a minimum. * If the color is odd (and you don’t like that!!) consider converting black and white. If you use my suggestions, please let me see how your shots come out! If you have a recipe of your own that works well, please share it!